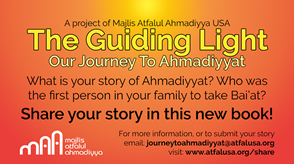 Majlis Atfal-ul-Ahmadiyya’s newest venture is to create a book detailing live accounts from Atfal, Khuddam and Ansar across their country about the origin of Ahmadiyyat in their families. This origin can be a companion of the Promised Messiah (as), the first person in your family to take Bai’at, or one of the first Ahmadi convert. It is a way to connect with the progression of Ahmadiyyat in Islam through the personal stories of those who were the pioneers who paved the way for us. We are working on a final plan and process so please reach out to us for any questions!